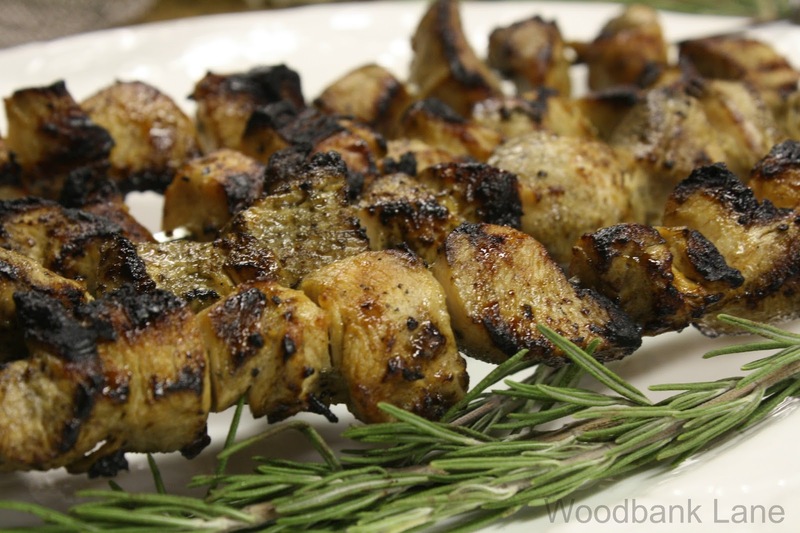 I love a kabob: fruit kabob, vegetable kabob, shrimp kabob, chicken kabob, steak kabob--you get the picture. 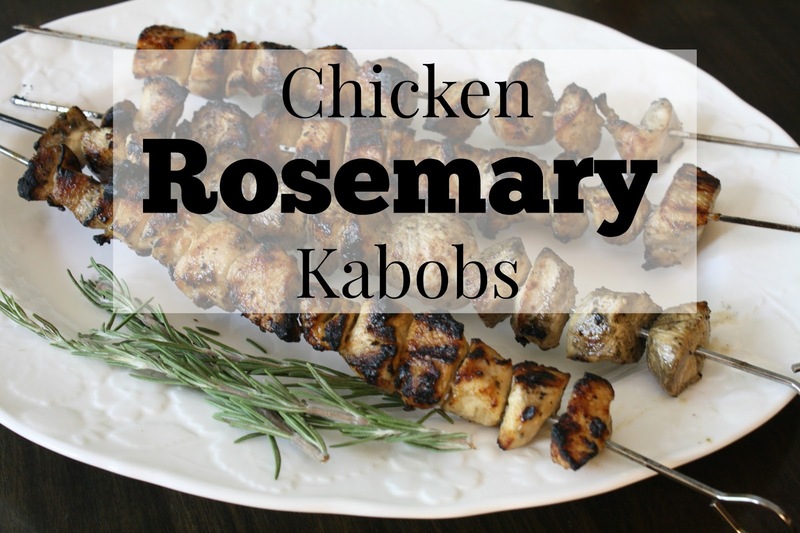 I was searching for something different to do with chicken and came across a recipe for Rosemary Chicken Kabobs. I tried it this week. It was super easy and many of the ingredients you probably have on hand. 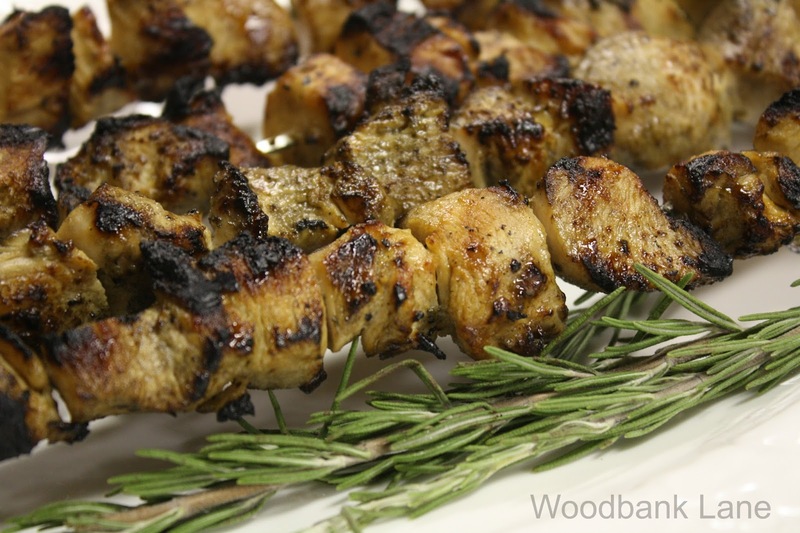 I'm sharing it with you today because it's definitely one you'll want to try, too. In a large mixing bowl (remember you'll be adding chicken cubes), stir together the dressing, olive oil, vinegar, sugar, lemon juice, Worcestershire sauce, salt and pepper, and rosemary. Let stand for 5 minutes or so, then add chicken. Coat all pieces well. Cover and refrigerate for 30 minutes. I had never minced rosemary before, so I watched a tutorial on Youtube. One thing I did that she didn't was cut the tan part off the bottom of the leaves after I pulled them from the stalk. Then, you just chop them like any other food. When the time is up, preheat the grill on medium-high heat. Thread your chicken onto the skewers and dispose of the leftover marinade. 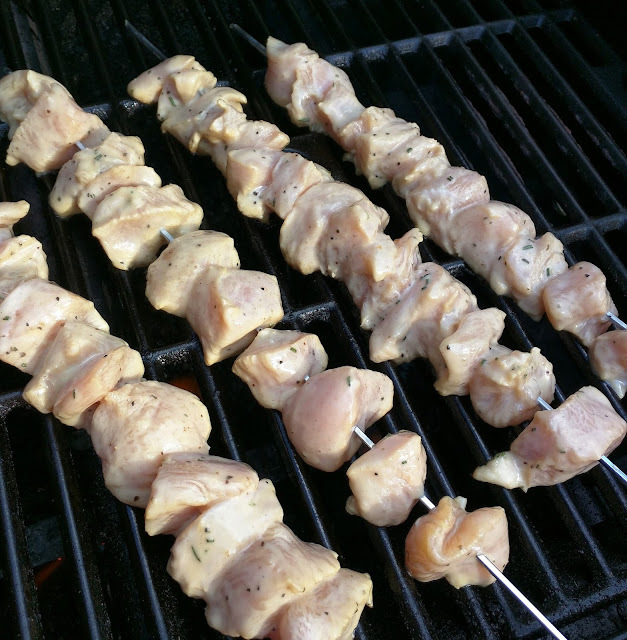 Grill the skewers for 12-15 minutes, turning every 5 minutes or so, or until the juices run clear and no pink is left in the middle. I always end up cooking things a bit longer than recipes suggest. Every grill is different. Just don't leave them alone for too long. I served ours with the usual: green beans, creamed corn, garlic tomatoes, and tea. For the garlic tomatoes, revisit the Chicken Pasta Caprese recipe I shared from my Skinny Taste Cookbook. The original recipe can be found at Allrecipes. Next time, I will probably add more Worcestershire sauce. The flavor was not as strong as I thought it would be. Unless you're feeding a crowd, you may have leftovers. It makes plenty!